I made this on Wednesday when Thomas was having his nap. I have to work quickly if I'm to get anything done, it's impossible to crochet when he is awake because all he wants to do is grab it off me! 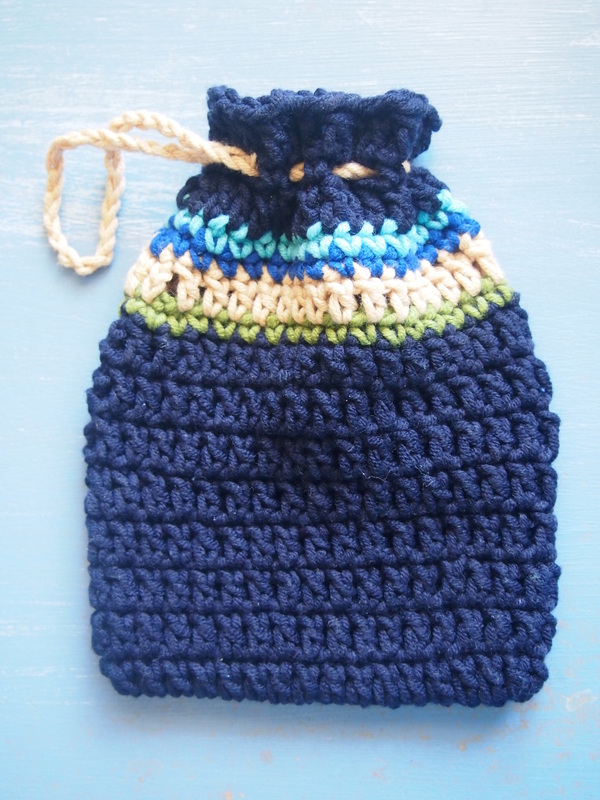 This is really simple to make, very similar to the bag I made last week but this time because it has less stripes I used some dc (UK tr crochet) and forwent the longer handle. It just has a simple draw string handle at the lip. To keep it simple, I used 5 colours from my collection of thick cotton blend, black, tan, green, blue and light blue. It's just the right size to put a small toy inside! I hope the recipient doesn't mind it, his first birthday party is on Saturday!